2008 February « GASTHAUS: got 'kraut? Our special is Beef Tenderloin Roulade. It’s beef tenderloin rolled and filled with garlic, on a tomato basil sauce served with Spaetzle. Mmmmmh! 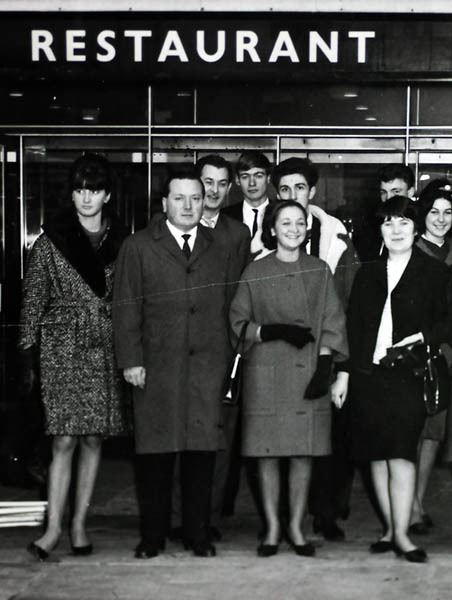 Diggin’ through some old pictures we found one made around 1963 of Annemarie, far left, outside of London Heathrow Airport after she attended a course by BEA (the former British European Airways). She was a travel agent at that time. She said the reason she wasn’t looking in the camera was because she was checking out a pilot walking by. Good to know! But can anyone guess which of her kids resembles her the most? Post your ideas here! 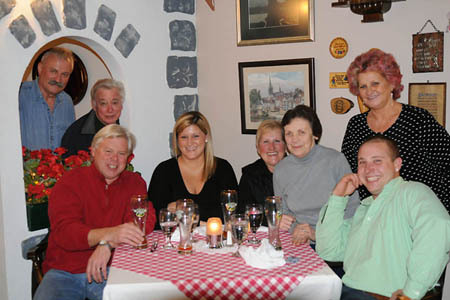 Tonight we had the pleasure of the company of our most loyal customers joining us at the Gasthaus: The Ballards and the Ensmingers. They both have been with us since the very beginning and it’s always nice to see them. Coming up soon are pictures of the early days of the Gasthaus with pictures of some of our most loyal customers who are now friends of the family. Prost! 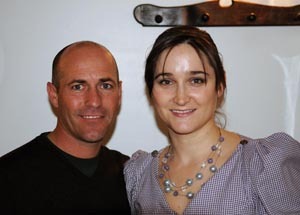 Jockey Gary Stevens, a three-time Kentucky Derby winner, ate at the restaurant tonight. Gary also starred in the movie “Seabiscuit.” He was nice enough to let Nina, his waitress, get a picture with him. Thanks Gary and friends for stopping by.